These secretive raptors live in forest habitats and fly from tree to tree with a low buoyant swoops. They hunt mostly from a perch within the tree canopy and they drop down to take prey on the ground. Both male and female build their nests. She stays at the platform while he brings selected twigs which he snips off branches with his specially notched bill. Their young are raised in the rainy season when their diet of insects, lizards and chameleons are plentiful. 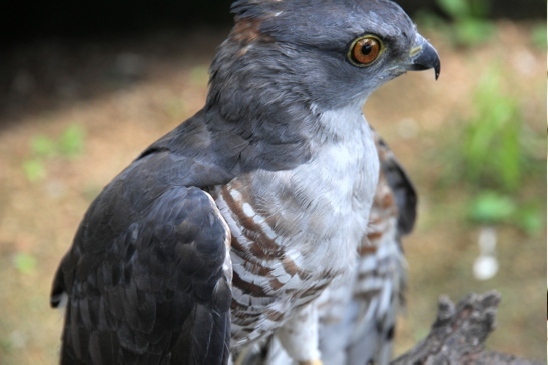 Cuckoo hawks are listed as ‘ Rare’ in the RED DATA BOOK and unfortunately are not on public display at the African Bird of Prey Sanctuary.